With diesel fuel prices soaring above $4 a gallon, independent truck drivers are getting scared and angry. Protests are cropping up across the nation, including one planned for this morning at the Capitol building in Harrisburg. "Normally, my fuel bill has been $50,000 to $60,000 a year. This has been true several years. This year, it will probably be over $100,000," said Mark Kirsh of Myerstown, Pa., organizer of the Harrisburg rally. The speed of the price increase has hurt, said Peter F. Swan, professor of transportation and logistics at Pennsylvania State University's Harrisburg campus. "There's a lag of several months before rates catch up. Transportation rates are indexed on a quarterly basis. In the meantime, carriers and truckers lose money." The impact of this growing problem could spread to consumers. Experts say a quarter of the nation's independent truckers could go broke and park their rigs, helping remaining drivers charge more and further drive up the cost of products. This is the worst time for truckers since the 1970s. Unlike 30 years ago, the Internet now gives long-distance independent truckers across the nation a way to organize protests such as the one planned in Harrisburg. "About 10 to 15 years ago, French truckers really made a scene," John C. Spychalski, professor emeritus at Penn State's Smeal College of Business, recalled last week. Truckers interviewed last week were boiling over. "I just paid $4.29 a gallon. We've got to let the political system know we exist," said Lee Klass, of Portland, Ore., interviewed by cell phone while passing through Ohio. That price means it cost Klass $1,200 for a fill-up that keeps him rolling for two days. 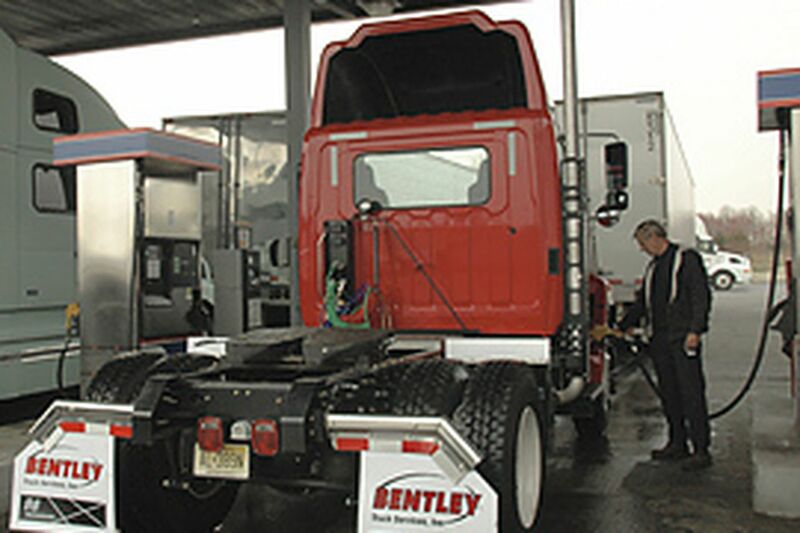 The rapid increase in diesel costs has forced drivers to dip into money saved for repairs and tires. "When my engine blew up, it cost me $15,000," Klass said. He had to refinance his truck, which he has driven 1.2 million miles. There are other costs. Drivers report paying $5,000 a year for liability insurance - and much more if they carry hazardous materials. "Physical-damage insurance varies. For a new truck, it can easily run $500 to $600 a month. My truck is eight years old and I pay $111," Klass said. An oil change is $160 to $250. "I have to spend $500 for brakes every four to five months - that's just for brake shoes. And just for the tractor. If you need brake drums, that's a whole lot more," Klass said. Drivers take pride in keeping their rigs shiny. Now, several said last week, they can no longer afford wash jobs, which cost $50 to $60. Big trucking companies are investing heavily in computerized route-planning and fuel-purchasing software and other sophisticated technology to cut fuel costs. But independent owner-operators have little to spend on technology that could mean future savings. "We've used up all the tricks, all the gimmicks to conserve fuel. All the rabbits have been pulled out of the hat," said Klass, the sound of his truck rumbling in the background. "Now, we're cutting back on meals we eat." Scholars estimate that a third of the nation's cargo is carried by independent drivers and small carriers. Big carriers and shippers use their own fleets and drivers for their base loads in high-traffic corridors. The independents handle peaks and cargo that big operators cannot make money hauling. "There has always been an imbalance of bargaining power between shippers and independent truckers," said Spychalski, the Penn State professor emeritus. There are few alternatives for big shippers, but a lot of brokers still are trying to get independent drivers to haul loads for $1 a mile when the per-mile fuel cost exceeds 80 cents, Spychalski said. In this environment, drivers need to know much more than how to drive a truck. Knowing whether the price offered by a broker is smart requires knowing the likelihood of getting another load, at a good price, near the destination, and at the destination beyond that one. The problems are clearer than the solutions. The drivers want more government regulation of rates - at least a law requiring brokers to pass on to drivers the money they charge customers in the form of fuel surcharges. That sounds good, "but how do you enforce it?" Spychalski said. Several drivers agreed. Brokers would just lower the rate they offered, they said. "It won't be easy to fix all of the factors that have put truckers in this predicament," Todd Spencer, executive vice president of the 161,000-member Owner-Operator Independent Drivers Association, wrote in his blog. Many economic issues have come together - U.S. dependency on foreign oil, a tight petroleum market, a slow economy and low freight levels, Spencer added. "All are so complex they will require long-term, painstaking solutions," he said. Meanwhile, in another, more blunt message, Spencer told OOIDA members: "Freight that doesn't pay enough should be left at the dock."